Like many baby-boomers, I grew up reading comics and thinking of Stan Lee as that crazy but lovable uncle who knows how to talk to kids. Plus, he worked in comics – how cool is that?! While I was big into comics for much of the 1970’s I didn’t really stay with it, but I did hear rumors of frustrations between different members of the artistic staff (writers and artists) and Marvel – and by extension, Lee. Bob Batchelor’s biography addresses some of this, which I found interesting, and typically seemed to relieve Lee of any wrong-doing (though it does mention that the memories of those days may not be the most clear in anyone’s memory). I enjoyed getting the scoop on Lee’s early days, particularly his war years, which was something I had never known about. First – I didn’t even know there was such as a thing as ‘playwright’ as an official Army designation. Even as a teen reader of comics, and despite my appreciation for all things Lee and Marvel, I was never a fan of Lee’s actual stories. He seemed, to my teen mind, too obvious and gregarious. But reading through this biography I have a new appreciation for the quickness by which he wrote, practically keeping Marvel running single-handedly during some of its earliest days. It takes a great deal of hubris to be able to run a company the way Lee managed to do, especially in the early days, and we see that hubris later on as Lee lends his name to new companies – including one that appeared to be nothing more than a ponzi scheme to capitalize on his name. While his cameo appearances in the Marvel movies are a truly fun nod to the early Marvel days and lead a new crop of Marvel fans to meet that crazy, fun uncle, there is a certain amount of excessive pride going on there as well. The book is easy to read and Batchelor moves through the different periods of Lee’s work life quite smoothly. What we don’t get, however, is almost as interesting. We don’t get much of Lee’s early life, other than how it seemed to inevitably lead to his taking a job with a publisher. We don’t get much of his personal life other than that he married. 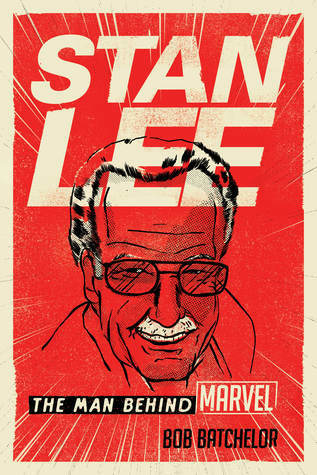 In this sense, the book isn’t so much a biography of Stan Lee the man, but Stan Lee the driving force behind Marvel and a comic renaissance. Maybe there is no difference? All in all, a good read, though I can’t imagine it will be the last or most definitive look at the comic/pop icon. Looking for a good book? Bob Batchelor’s biography Stan Lee: The Man Behind Marvel is a nicely written and well-researched look at the man who, in his mid-nineties is a living pop icon.